Rubi CEV 200mm Diamond Blade (Ceramic Tiles) - ONLY £29.99 (+VAT) - SAVE £5! Rubi CPC 200mm Diamond Blade (Porcelain Tiles) - ONLY £44.99 (+VAT) - SAVE £5! Marcrist CK850 200mm Diamond Blade - All Tiles* - ONLY £59.99 ex VAT - SAVE £5! 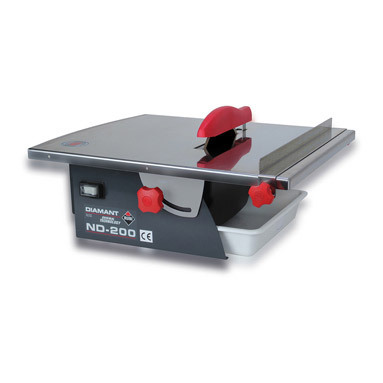 Rubi ND 200 portable electric tile saw for cutting & mitring. 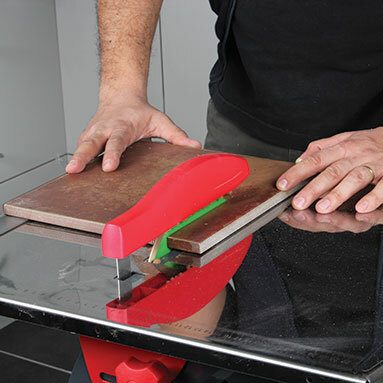 Ideal wet saws for use on gres (stoneware), ceramic, glass, tiles, marble & other materials. Rubi ND200 also available in 110v variation - click here! Stainless steel plated table tips up to allow mitring up to 50cm (20"). With guide to allow repetitive cuts. Thermic security switch and water refrigeration of the blade. Includes 1.5m (4'9") electric cable. Includes Rubi Basic Line blade 200mm - for light use only. Single-phase motor 1.2HP - 0.88kW. Maximum cutting thickness: 40mm (1 5/8"). Maximum cutting length: infinity (as big a tile as you can handle). Dimensions: 51 x 52.5 x 24cm.